Two tales of crime and punishment, featuring Marvel's most lethal marksmen! 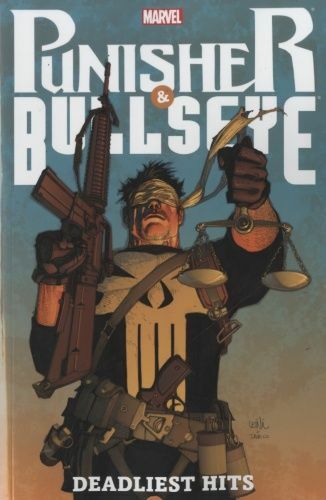 First, the trial of the century begins when the Punisher surrenders to police and admits to murdering a district attorney! As Frank Castle faces justice, and Matt Murdock becomes a witness for the prosecution, is this the end of the Punisher's war on crime? Then: For a year, Bullseye vanished without a trace. Funny thing is, he was hiding in plain sight on the ball field, throwing heat that could take off a man's head. Every man needs a challenge, a moment when he looks deep inside and sees what he's made of. Bullseye's next pitch is one for the history books! Diesen Artikel haben wir am 22.02.2017 in unseren Katalog aufgenommen.